Most businessmen and women in Hollywood think they have what it takes to build the next big label. Most producers think they know better than the studios and can do one better. But there are fundamental differences between building a studio and building a production company. Production companies see life picture to picture and rarely lock their future in place. Some production company heads have long-term goals, but most are contingent on the success of the company’s material slate. That’s true for all content creators, but production companies fall short by investing all eggs in the movie basket. Studios take a bigger piece of the pie. The difference between production companies and studios? Studios have assets and scope. Successful studios operate more like landlords and parents than artists or producers. They own backlots, prop houses, sound stages, post production facilities, restaurants, libraries, other companies, equipment, hardware, software, websites, networks, satellites, and more. A sizable portion of the sustainable revenue comes from operating and renting out these assets. Furthermore, most studio executives speak in slates and four year periods. They work hard to see into the future and see past the big fat movie release in front of them. Strong studios invest in things other artists use to tell stories, and they also invest in long-term strategy. Are you in it for the movie game alone? Or are you in it for the big picture? The long haul? Decide what you want to build. Do not lie to yourself about what you care about. The Project Triangle concept was first conceived in the engineering world and has helped me navigate countless managerial decisions in Hollywood. 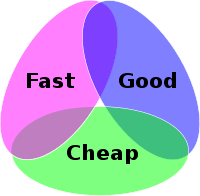 For those not familiar, the Project Triangle rules that you can only pick two of the three: Good, Fast or Cheap. The logic makes sense and can help you rapidly prioritize through difficult, urgent decisions. In film, there are many – especially as a studio executive, producer, or coordinator. If you want quality work done quickly, you cannot expect things to be cheap. Talented artists who can move fast without missing a beat are extremely rare and therefore extremely expensive. Want a Director of Photography who can make 45 setups a day look like Leibovitz? Start at $3,000 per day. 3D conversion of a feature film in 45 days? $12-15 Million base. If you want the project resolved promptly and to cut costs, do not expect top-notch work. Running and gunning a show with cheap labor opens the door for creative and technical mistakes. Many independent films do not gain traction because they simply lack the resources and time to reach distributable or marketable quality. Entire companies like The Asylum have embraced mediocre output to sustain business and cut substantial costs. If you want to win awards and save money, be prepared to wait a very long time. If you are lucky, the material is strong enough to inspire great talent for scale cost – but you have to work around their schedules. Everyone needs to pay the bills – and my pro bono contribution to your breakout short will take the back seat to my full-time job. Sorry. I think you can accomplish all three triangle points in one project, but most likely as a weekend passion project or a random conceptual twist of genius. Very rarely, great work is created in little time with no money. As an administrator or producer, you cannot bank on that roll of the dice. Be prepared for only two of the three; hope for the third.